Writing doesn't always fit a 9-to-5 schedule. Assignments bounce into your inbox at all hours of the day and night, the news cycle does its thing whether you're awake or asleep, and the complexities of juggling your life often result in laptops being pulled out of their sleeves at the strangest times and in the oddest of places. At the same time, that teenaged boy making his way across the deep end of the pool at his grandfather's condo in the photo above isn't going to be a teenaged boy forever. And he isn't going to want to hang with his dad forever, either. So when he asked if we could go down to the pool for a bit, "no" wasn't an option for a whole lot of reasons. And yet, deadlines beckoned and life on the outside continued to do its thing. The world doesn't stop just because you've decided to chill out for a bit. 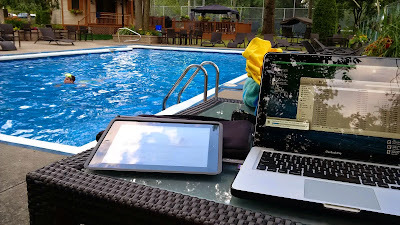 So I toted my backpack-full-of-tech with us to the pool, and set myself up on the lovely outdoor furniture you see here. It didn't take long for me to finish what I was working on so I could get back to the very serious business of simply watching our son be the little boy that he still is. Someone, after all, needed to time his laps, suggest changes to his stroke and complain about the bugs that always seem to come out as the sun begins to set. I appreciate that when deadlines beckon, the folks on the other end of all that geeky equipment you see here don't care much that you have a life outside of the narrow window of work that guides your professional relationships. They want you to deliver so that they can keep their lights on. And you need to deliver so that you can keep your own lights on. But unless we find room in all that keeping-the-lights-on-focused activity for moments like this, we'll never know what it's like to snapshot an indelible moment in the life of a child. Or feel like all that busy work we do on the outside is being done for some higher purpose. Because if the work is all that matters, to the exclusion of seemingly small moments like the one you see here, then it doesn't really matter much at all, does it? I think it is so, so important to keep talking to teens. Somehow, but keep talking. And if you are not there then you can't talk, can you? And you've lost them. And what they turn to, instead, makes my blood run cold.